Or neither. Well, isn’t this a useless post? I am referring to the Global Corruption Barometer released by Transparency International a couple of weeks ago, which I covered at my other blog. For the most part, there were no surprises; the only really strange figures came from Taiwan, where 36% of people claimed to have paid a bribe in the past year. Otherwise, the results largely cut to popular perceptions and stereotypes of corruption in various countries. The really bad thing is that this time round there was no bribery incidence data for Russia, not to mention eleven other countries – and China wasn’t included in the survey at all. I investigated this further, and was told that Russia’s results along with those of the eleven other countries didn’t pass Transparency International’s validity and reliability tests. 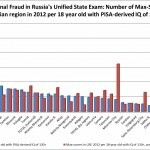 (1) Why didn’t Russia’s incidence of bribery data (as well as several other major countries like Brazil, France, and Germany) pass TI’s validity and reliability tests for inclusion? (2) Would it be possible to get access to Russia’s bribery data anyway, with the caveat that those figures would have a lower degree of reliability and should not therefore be counted as part of Transparency’s official records? I am afraid not. We take the findings of this survey very seriously as a reflection of people’s views and experiences of corruption. Given the importance of this data and how it can be used to inform the fight against corruption, we will not making available data that does not pass our validity and reliability tests. Would it be possible for you to at least indicate whether Russia’s outlier this year was above or below the trend? It would at least give me some sense of comparative perspective should Russian polling agencies come out with their own bribery polls this year. As we do not have confidence in the reliability of the data I can not provide further information on this to you. Well, I tried. But the results for this year must remain a total blank. You are free to speculate whether there could have been any political motivations to that. For my part, I will just say that this is a real shame since at this rate the next time we’ll get data for Russia from the GCB – assuming its data passes their validity and reliability filters next time round – will be in 2015. 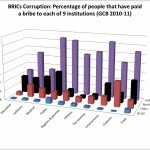 So for now DR readers will have to be satisfied with a bribery incidence graph that only stretches to 2012. Let us hope that Russian pollsters move in to fill the gap left by the GCB sooner rather later. UPDATE: Thanks to Fedia Kriukov (for digging up the article) and Moscow Exile (for translating it at The Russian Spectrum): A Crisis of Zombification: How Transparency International failed on The Russia Corruption Rating. Please read it. The author, Andrey Kamenetsky, pretty much conclusively demonstrates that the reason Transparency International didn’t include Russia’s bribery incidence data in their 2013 report was because it was lower than expected.